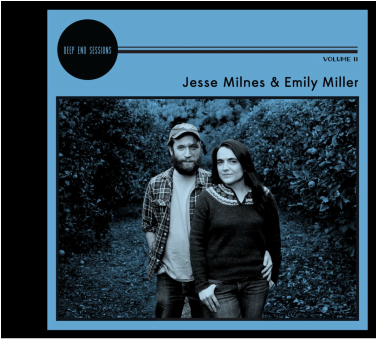 Jesse and Emily have released a duo record of fiddle tunes and songs. Recorded at the Deep End Ranch in Santa Paula, CA, this collection showcases Jesse's West Virginia fiddling style, Emily's country and traditional singing, and their love of close harmony. Visit the store to get your copy today! You can also check out some videos from the Deep End Sessions house concert and other live shows on our "Watch & Listen" page. 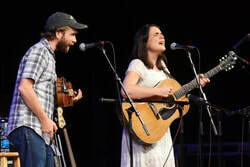 ﻿In August 2015, Jesse and Emily appeared on NPR's Mountain Stage alongside Rhiannon Giddens, Alice Gerrard, Sam Gleaves and the Steeldrivers. You can now stream the entire show through the Mountain Stage website. Jesse and Emily begin at around 29:00. Jesse Milnes and Emily Miller perform country and old-time music, singing close harmony with Jesse's unique finger-picked guitar style and a healthy dose of old-time fiddling. Emily was raised playing and singing old-time and country music (the Louvin Brothers and the Stanley Brothers were household favorites) with her parents while they traveled the world as journalists. Jesse grew up in the world of West Virginia old-time music, learning from masters like Melvin Wine and Ernie Carpenter as well as his father, Gerry Milnes. They now make their home in central West Virginia. In addition to their duo performing, Emily tours extensively with The Sweetback Sisters (a 6-piece country band fronted by Emily and her pseudo-sister Zara Bode), they both play for square dances around West Virginia, and also frequently teach harmony singing with Emily's mother Val Mindel.